kochi - Kochi is complete. I’d been planning what to write here for ages, years, now Kochi has finally been shown in it’s complete form. But now it’s actually finished, my brain’s gone blank. This started out as such an ambitious project, took so long to eventually make flesh, and is such a personal favourite of all the things I’ve worked on, anything I say will just be pointless frilly decoration around it. So instead I’d like to invite you who have read it to offer any thoughts. Did everything make sense, or was it pleasingly ambiguous? And i’d LOVE to hear any theories on what you think Kochi is about. I sweated over the ending a lot, trying to work out the best way to conclude it and yet still leave it open, so I’m hoping it paid off. Early next year I’ll post up an essay I wrote on what Kochi is actually about, for me anyway, but I don’t want to toy with anyone’s personal interpretations of it so I’ll keep that quiet for now. And if you have any questions, please do ask! If you don’t understand bits of it, if you want to know ANYTHING about Kochi (including where it would go from here), I welcome any discussion. Either comment here, or you know where to find me on email, twitter etc. Lastly, thank you SO much for the support. It seems like people have really enjoyed the ride, and that’s very gratifying. All the comments and nice words were very appreciated. 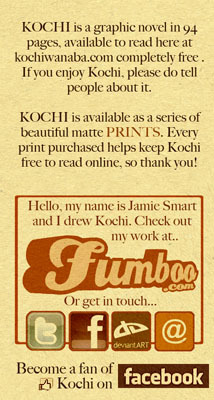 Now it’s complete, if you want to tell others about Kochi, please please do. Anything to help spread the word, anyone wanna do a feature on it, any publishers wanna consider taking it on, or even just telling a friend ‘hey you like comics, read diss’, it all really helps in getting work like this out of its niche-like bubble. So happy christmas! Thanks for joining the ride! Wow, I have thoroughly enjoyed the ride, thank you Jamie! I can say for definite that is was pleasingly ambiguous. It’s something I will ponder over for a while, and over time I think more of it will make sense, but I like the fact that it’s never going to make complete sense to me. I’ve already posted my “Read this NOW” command on Facebook and I will bug everyone I know continuously until they read this, they have to. I’ll post a better comment when my brain has had chance to digest Kochi a little more, just wanted to say ‘thanks’ straight away. I have really enjoyed reading Kochi, and I think it’s been nice to be fed the story a little at a time – it’s been exciting opening up the page with each new update to see what’s happened now! I think I’m going to go back and read the whole thing through in one go before I try to figure out my interpretation of it. There are a few things floating around in my head about it but they don’t seem to fit together just yet. It will be interesting to read your essay on Kochi when you post it. I love the style you’ve used for this comic, it’s been a nice change from all the bold bright colours that are around at the moment. And I would love to see this in print if it ever happens *fingers crossed*. Thanks for sharing this with us, it’s been an amazing trip!